Next up in our Escape-athon 2017 celebration: an FSF from guest writer Jacob Lusk from Panned Review! It seems fitting today to invoke a post-apocalyptic movie, albeit one of the most non-threatening post-apocalyptic movies ever made. 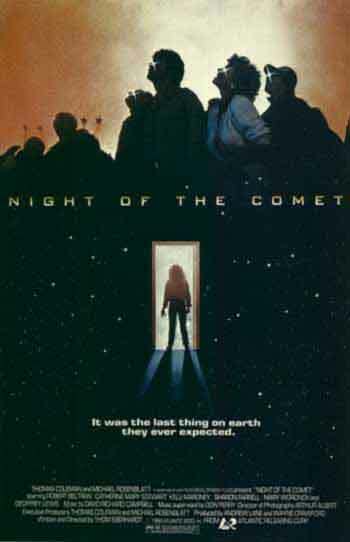 Night of the Comet (1984) is a sci-fi-comedy about two teenage sisters from the Valley, Reggie (Catherine Mary Stewart) and Samantha (Kelli Maroney), who appear to be the sole survivors after a comet strikes Earth right around Christmas. Since the film takes place in Los Angeles, Night of the Comet captures the already other-worldly feeling of spending your holiday season in a warm climate, where the Christmas carols and decorations feel completely incongruous (a feeling I’m accustomed to as a native Floridian). In one scene, Reggie is riding a motorcycle through downtown L.A. the morning after the comet, still unaware of the fatal change that has taken place; she stops at a red light, next to a Mercedes, inside which the radio croons “Jingle Bells”, only with no driver in the car to listen to it. This complicated comet only pushes life further into the extreme. While there are a few survivors who, like Reggie and Sam, seem totally fine (including Hector, a handsome, resourceful guy—played by Robert Beltran—who happens into their lives unexpectedly), almost everyone else has been reduced to an orange dust. (Think Trump, if he were a Kool-Aid mix.) Others, meanwhile, have been turned into “freaked-out zombies,” slowly dissolving into the Trump dust, but in the meantime, doing the usual work of zombies. There’s also a cadre of malicious scientists (headed by Geoffrey Lewis and Mary Woronov) trying to find a serum that will cure people who’ve been “partially exposed.” Essentially, everything you could possibly want from a movie of this kind. Earlier, we see Reggie and Sam familiarizing themselves with machine guns they’ve somehow managed to get hold of (their dad was in the Marines and taught them how to shoot). So this gunfight is between equals, and Reggie proves smart and fearless, while Samantha is cheeky and impulsive: the right combination for any duo. Reggie dodges sprays of bullets and fires back with the confidence of a double agent (dressed in a snazzy black leather dress). And while the scene is exciting and tense, it also seems to be perpetually sloughing off the reality of its world, lost in a teenage haze of deluded euphoria. Awesome post Jacob! I just saw this for the first time a few years ago and it's a lot of fun. I knew what scene you must be talking about before I even started reading, because this one is definitely the most memorable part of the movie. Those girls are totally badass. Thank you! I'm glad you're a fan of this movie too.